When disasters strike, people need food, water, shelter and medical care. They also need information, and to be able to make contact with the outside world. Like the Polaris, the Polaris Plus is an effective tool in an emergency. 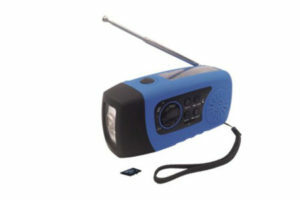 It is an FM radio that will provide information on what to do and where to go for help, plus it’s an MP3 media player that plays pre-loaded content. By playing content through a microSD card, the Polaris Plus delivers targeted messages in languages people understand. Health messages and educational content can be easily created and loaded for distribution to displaced populations. The content can be paused, fast forwarded and repeated as often as necessary. The amount of content that can be pre-recorded depends on the size of the microSD card. Content can either be recorded at our factory, or locally. For a small device it has excellent sound quality, making it great for groups of up to 15 listeners. In addition, it has an LED flashlight and cell phone charger capability that will enable people to make a short call or send an sms message. The unit comes with a charging cable and two cell phone tips. The rubberized Polaris Plus is power independent, and can be powered in one of three ways: by the sun, by hand, or via mains with a USB charging cable.